Be sure to write ALL questions (multiple choice and open-ended) on the left and answer them on the right. What is the system responsible for giving us the nutrients we need to function? How many primary organs can we find in the human digestive system? 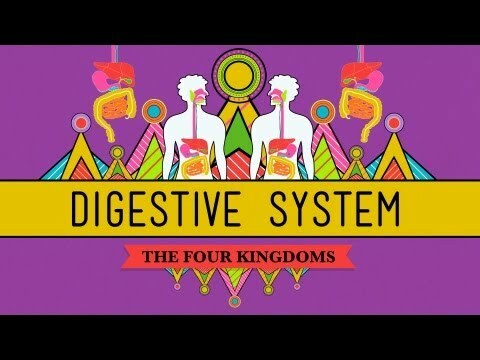 Why is the digestive system important for humans (or all animals...yes, we are animals)? When the host uses his teeth to chew the apple, what type of digestion is taking place? The small intestine is the longest part of the digestion process. At what organ does the human digestive system begin? The saliva is responsible for the beginning of chemical digestion in the mouth. The second stop of the digestive system is where? Between the mouth and esophagus there is a piece of cartilage and tissue called...? The trachea is the known as the windpipe and belongs to which system? The food doesn't just roll to your stomach like a bowling ball down an alley. It is pushed down through a muscular contraction process called ___? What are the 3 ingredients for gastric juice? Google the images for 'chemical burn hcl' later for a visual. Pretty gross. No link this time. The first part of the small intestine is called the ____. Simply put, your small intestine is where the nutrients from food is broken down and sent to the rest of your body for nutrients and energy. Villi are responsible for taking up those nutrients for energy. Think about my favorite part of the simulation with the Mario music. Bile is produced in the ______, stored in the _____, and is used to break down ______. What is the primary role (function) of the large intestine? Wait...how long does the digestive system take to digest food?